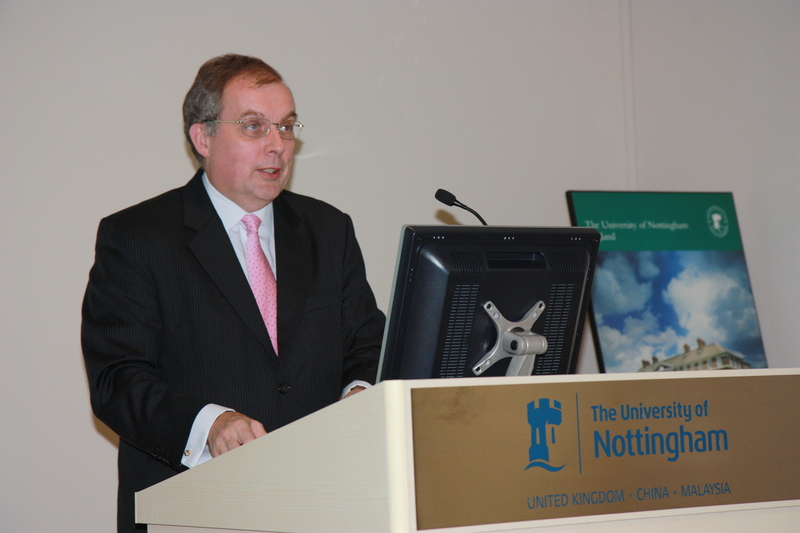 We were fortunate to have the Boustead Annual Globalisation Lecture delivered by His Excellency Simon Featherstone (British High Commissioner to Malaysia) (21st Feb 2013). This is a lecture which is given as part of Nottingham’s Centre for Research on Globalisation and Economic Policy (GEP) annual conference which has taken place in Malaysia since 2008. This years conference focussed on Recent Developments in Asian Trade Policy and Integration. The talk given by Simon Featherstone was entitled Trade, Tax and Transparency: the G8’s priorities in an Asian context. The lecture was well received, raising a lot of questions, some which were tabled during the Q&A session and leading to a lot of discussion at the reception held after the lecture. An innovative feature of the talk was the use of Twitter. The High Commissioner has recently started tweeting and he encouraged the audience to tweet comments and questions using a hashtag of #hcttt (High Commissioner Trade Tax Transparency), offering a prize to the best tweets. If you want to follow Simon Featherstone on Twitter, his handle is HCSFeatherstone. We have also uploaded some pictures of the lecture.